Today I’m answering a recent question from a homeschooling mom asking about what comes with Daily Lesson Plans. I want to make sure that I am understanding ordering options correctly. The 1st grade daily lesson plans are $250 for the lesson plans. This does not include the lists of books, the teacher manuals, or the k-2 unit program? I guess what I am really trying to ask, is, side-by-side, what are the exact differences between the Daily Lesson Plans and the Unit Programs? Thank you for your time. M.
Thanks for your inquiry! First I’ll tell you about each type of program and what it includes so you can clearly see the differences. I’ll start with the Unit Programs, since that is what we created first. a list of suggested books divided into historical units, then by topics within those units. In each of our program components there are enough books suggested for 3-4 years. In fact, there are about 400 book suggestions in each of the four Unit Programs. All pre-read and carefully selected by one of the authors. 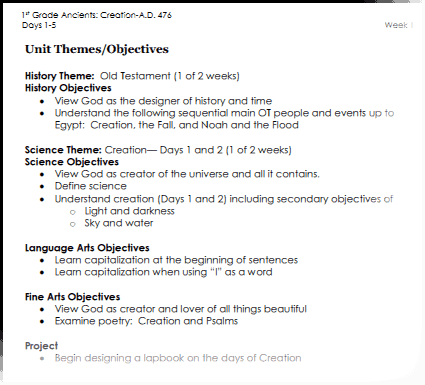 For each unit, we provide a page of history and science activity/assignment ideas for you to choose from, with more assignment and activity options added for each level of the program. The Teacher’s Manual that comes with each unit program tells you how to teach history, science, grammar, punctuation, writing, spelling, vocabulary, and more, using living books. In it, we teach YOU how to teach. For example, in language arts, we teach you how to select copywork to teach English skills, rather than doing that for you. We give you tools like English Skill checklists, phonics checklists, assignment ideas, planning forms for each of the grade levels. We also provide a Teacher’s Overview or summary of the important events and people of each historical period. These are more detailed at the Preparatory and Secondary levels. So with each of our Unit Programs you have all the tools you need to teach three (or four, in the case of high school) years of school. You can create the structure if you want to, but most people choose our unit programs because they don’t want the structure. Rather than having everything planned in advance, our Unit Study moms want the freedom to read what they want, when they want. They read and do what they want in terms of assignments, and then write down what their children did after the fact,rather than planning it all out in advance. Read more about our Unit Programs and see samples here. creating a short teacher’s guide to the daily plans that describes how to best use them, how to set up student notebooks, a summary of the Charlotte Mason methods we use in the plans, how to teach narration, and more. So we give you the TOOLS to create that kind of structure in the Unit Programs, but most people who use them don’t want that much structure. Instead, they prefer to go to the library and grab books, choose project or activity ideas in history and science every week, choose 3-4 English skills from our checklist and find their own copywork selections. They informally cover spelling and vocabulary words as they come to them from the history and science reading. So we give you the TOOLS to create that kind of structure in the Unit Programs, but most people who use them don’t want that much structure. They would prefer to go to the library and grab books, choose a project or activity idea in history and science every week, choose 3-4 English skills from our checklist, find copywork selections, spelling and vocabulary words from the history and science books to illustrate the English skills and just journal what they ended up doing, rather than planning it all out ahead of time. So although the tools are there in the Unit Programs, YOU decide what you are going to do with those tools, whereas in the Daily Lesson Plans we have taken the time to plan all of that out FOR you. Then they just journal what they ended up doing, rather than planning it all out ahead of time. They include specific, daily reading assignments, narration prompts, discussion questions, all assignments, evaluation tips for the assignments, copywork selections, grammar assignments and teacher keys, for one school year. Each week you have the teaching objectives laid out for you so you can see what your educational goals are for the week. Additionally, we provide a specific book list for each week, along with a list of any resources and supplies you need for that week’s activities. We also provide detailed instructions for any of the projects or activities we have in the plans. You can see a sample week of our first grade daily lesson plans here. So rather than informally deciding what to read and what activities to do, like in the Unit Programs, with the Daily Lesson Plans you read over everything and gather your supplies a week or so in advance, then you have an open and go experience. So, you don’t get the Primary Unit Program, Teacher’s Manual or extended booklists when you order the Daily Lesson Plans. You don’t need those things, because you already have everything you need to teach the year in the plans themselves. That said, some people decide to add the Teacher’s Manual with the Daily Lesson Plans just because it has additional background information about teaching the subjects we cover. But you can certainly do just fine without it. Some people buy both programs together so they have additional books listed and have the Teacher’s Overviews for each historical unit — but again, this is not necessary, and most people don’t do that. We’ve learned over the many years we have been doing this that moms usually prefer the unstructured OR the structured type of curriculum. So which type of curricula do you prefer, M.? I hope hearing the differences clarifies things a bit. Let me know what you think and anymore questions you have, M.
I hope that clarifies things for YOU, too, if you were wondering exactly what comes with our Daily Lesson Plans! 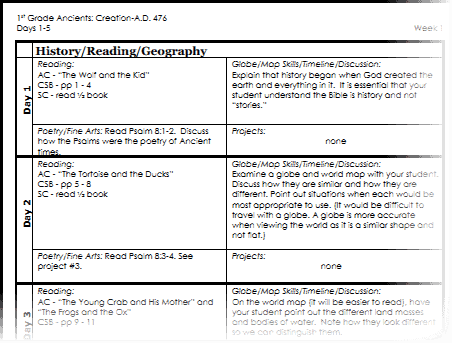 For more information specifically about the layout of our Daily Lesson Plans with a look at each individual page, check out A Closer Look at our Daily Lesson Plan Layout. If you have questions about anything you see on our website, please email at infodesk@trainupachildpub.com or fill out the contact form found on every page of our website.